Electronics manufacturers face a difficult set of market forces, such as rapidly changing customer preferences, shrinking operating margins, managing a complex global supply chain, and uncertain demand. In order to help our customers navigate this ever-changing landscape, Epec endlessly improves our processes, products, and services to provide our customers with an exceptional customer experience. We will do things right the first time, all the time. Understand customer expectations and needs. Continuously create and deliver new values to customers. Resolve customer problems promptly. Epec prevents recurrence of problems by truly understanding root cause and eradicating its cause. Establish a world class quality management system and improve the effectiveness of the system continuously. Establish quality objectives based on our customers' perspectives and then measure ourselves against those objectives. A critical component of realizing operational excellence is setting up a metrics program that can increase visibility into progress toward our objectives as well as shed light on areas for improvement. The Epec team is committed to understanding customer expectations, and then exceeding them through flawless execution of core values, processes, statutory and regulatory requirements, and quality. We are empowered to improve and find a better way, and united to not only be great, but contribute to our customer’s greatness. Given the competitive nature of the electronics industry and with many options available to buyers, the need for producing high quality products and processes does place considerable pressure on electronics manufacturers. Through Epec's Strategic Planning process we continually initiate operational excellence programs to ensure alignment and harmony between key resources. 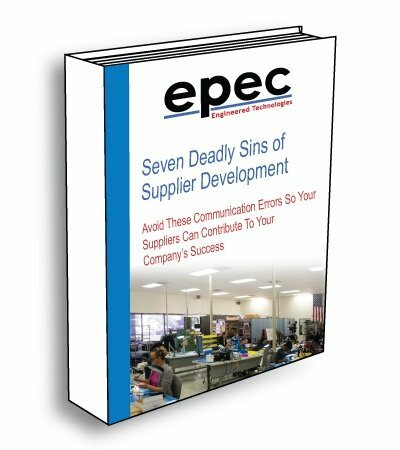 Specifically, there are many steps Epec takes to effectively leverage people, processes, and technology to optimize the cost of quality and make measurable improvements toward these objectives. Quality management initiatives are backed and led by the highest levels of the organization. Epec requires that all our employees be involved and an active participant in developing policies, internal educational programs, and SOPs, to spread a culture of quality that promotes measurements and improvements in all functional areas. At Epec, quality is everyone's job, not just final inspection. The ability to scale any business is based upon a company's ability to set up repeatable and functional processes, procedures and work instructions. Epec has an extensive and detailed group of these which include the establishment of a formal enterprise-wide CAPA process, closed-loop process across the value chain, real-time statistical analysis of internal and external activities, and more. Emerging technologies such ERP are helping organizations streamline cost of quality data from various business processes across the value chain to a centralized and standardized information management system. Epec has invested heavily in the industry leading Cloud ERP Business Management System NetSuite, in Autodesk's PLM 360 which has product lifecycle management capabilities that makes our product development processes more efficient, allows us to get products to customers earlier, and empowers every department to make our entire business run faster. In summary, the term quality management refers to the approach an organization takes toward ensuring customer requirements are met. Too many times quality is only referred to as the product going to the customer. While this is important, quality starts at Epec when we answer your inquiry and extends all the way to you, the customer, receiving your shipment complete, accurate, and on time. This is our focus, and we at Epec are dedicated to improving every day.